When I think of Valentines day I think of the standard bright red lip. It’s a makeup look that is pretty timeless and a red lippie is just a staple for anyone’s collection. However getting the perfect pout worthy lips can be no easy thing and especially in this cold weather. Chapped lips are one of my major pet peeves and through the winter they’re something that I get constantly and struggle to get rid of to be honest. Is it just me or does any old lip balm just not work anymore? Recently I was sent a sample of the new Balance Me Lip Quench Balm which is launching soon and I can tell you now that I have been really impressed. There’s little that can soothe my lips but this little products really does give it it’s best try! I’ve been applying this of an evening before bed as part of my daily routine and over the past weeks the skin on my lips has improved ten fold. They’re no longer anywhere near as chapped as they were previously and they feel so much more nourished and soft. I’m not usually one for sticky balms, but this one is worth the glossy and slightly tacky texture as it’s really seemed to be working. This Balance Me Lip Quench Balm is packed full of Shea, Cocoa and Mango butter to defeat dry skin, plump and soften them and it doesn’t have any petroleum jammed into which is something I’m really grateful for as I really cannot stand petroleum based products -Vaseline definitely isn’t for me! 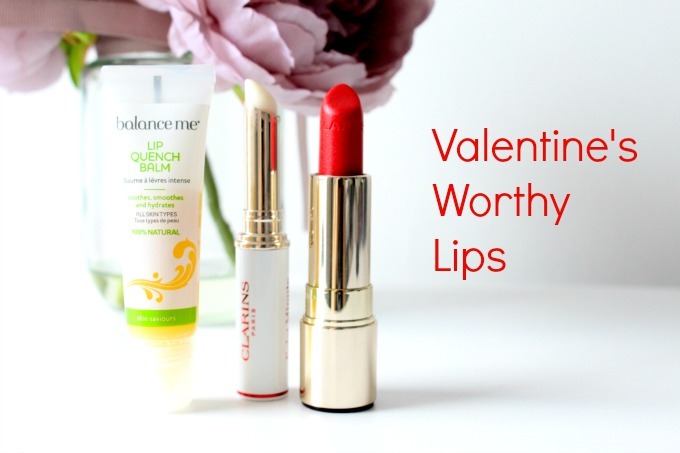 Along with this lip balm every evening I achieve my perfect Valentines lips by applying the Clarins Lip Perfecting Base (which is basically a primer for your lips, read my review here). This base smooths over any left-over imperfections to give a flawless base for your favourite red lipstick! I am currently loving the Clarins Joli Rouge Brilliant in Cherry as it’s such a great glossy red for a romantic meal out! You can find Balance Me products at BeautyExpert.com and Clarins products from the Clarins website. What lip saviours have you been using lately? Have you tried any Balance Me Products before? Next Post 5 tips for Staying Positive whilst Blogging!